Whether you're hosting an informal luncheon or an elegant affair, Olives Catering provides the perfect assortment of food and desserts to meet all of your catering needs. Olives Catering is a full service off premise caterer and will provide warming dishes, tables, silverware, and etc. upon request. Our professional servers on staff are also available to help with serving, bartending and clean-up duties to make sure that the hosts are able to fully enjoy the festivities. Custom menus are also available from our trained staff. Olives offers catering for any kind of party, including breakfast, lunch, and dinner for your next corporate or office party! 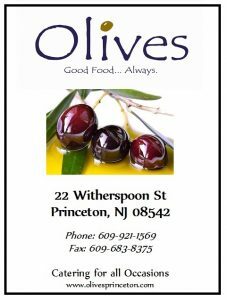 Please give us a call at 609.921.1569 to speak with an Olives' Catering Specialist today! Our catering menu changes seasonally and based on the finest and freshest produce we have available. Check out our current catering menu and give us a call to place your order for your next office or home party. Click here to view our Catering Menu. Get more frequently asked questions and answers about Olives catering services.